UI-related text control is a one-line input field with a label. value (string, number) - the initial value for a text field, can be editable or readonly on your choice. labelPosition (string) - defines the label position related to the input field. There are two possible values: "left" (the default one) and "top". inputAlign (string) - the input alignment towards its container. Possible values are "left" and "right". An input is left-aligned by default. 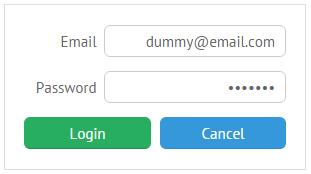 type (string)- the type of a text field, can be either "text" by default, or "password", or "email". Type is vital for HTML5 input data validation. placeholder (string) - the initial text in the text field disappears as you start typing in it. suggest (array, string) - a collection of suggest values, or the ID of an attached suggest list with these values. allow - a set of characters that are allowed for entering into the field regardless of their position. format (string) - a number format applied to a text input. See the details below. At the same time, "text" properties can be set via the attributes object containing properties that coincide with HTML input tag properties. The object is used for HTML5 data validation. title (string) - a prompt message that appears on moving a cursor over the field. The same functionality is true for Textarea. The functionality is available in the PRO edition only. You can set a custom format for entering number values into input fields with the help of the format property of the Text view. 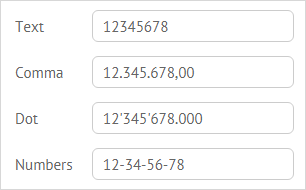 You can apply the number format depending on the set locale.